Turkey and African countries on Monday agreed to have “a streamlined and focused African Union-Turkey partnership, a statement said. The Turkey-Africa 2nd Ministerial Review Conference was held in Istanbul with 19 African countries in attendance. In a statement -- titled The Second Ministerial Review Conference of African Union-Turkey Partnership -- the member states said they discussed “further steps in order to enhance the cooperation between the African Union and Turkey”. The African Union welcomed an increase in the diplomatic representation between the African countries and Turkey. Turkey currently has 41 embassies in African countries, up from only 12 in 2009. There are 33 African embassies in Ankara. Turkey aims to open embassies in all 54 African countries. The importance of trade and investment between African countries and Turkey was also noted in the statement. The statement said the member states also agreed to organize biennially forums such as Turkey-ECOWAS (Economic Community of West African States) Economic and Business Forum, which will be organized next week in Istanbul. Jerusalem remains at the heart of the Israel-Palestine conflict, with Palestinians hoping East Jerusalem -- which has been occupied by Israel since 1967 -- might eventually serve as the capital of an independent Palestinian state. U.S. President Donald Trump last December recognized Jerusalem as the capital of Israel, and by doing so triggered international outcry. The ministerial meeting in Istanbul is a precursor to next year’s Third Turkey-Africa Summit, setting the tone and agenda of deliberations for that meeting. Since 2004, Turkish President Recep Tayyip Erdogan has paid official visits to 24 African countries accompanied by ministers, bureaucrats, and businessmen and spearheaded the signing of many bilateral pacts between Turkey and African countries. Since 2009, Turkey has also provided the African Union annual support of $1 million. 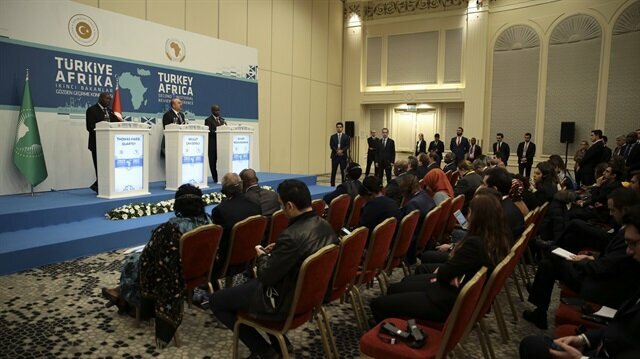 “Turkey’s bilateral trade volume with Africa has reached $ 17.5 billion in 2015. This is a three-fold increase in volume compared to the records of 2003,” according to Turkish Foreign Ministry.